Arts Theatre, Thu 6 Jul. With music and lyrics by The Bee Gees and based on the 1975 article Tribal Rites Of The New Saturday Night and the famous 1977 movie, you would think that the musical version would be a sure hit. The show continues to tour the world, but fails to win awards and is reported to have confused audiences buying tickets hoping to relive some exhilarating 1970’s disco memories. The story actually covers some powerful themes including family violence, Catholicism, suicide, abortion, racism, sexism, alcohol and other drug use, but awkwardly doesn’t bring many of the themes to any comfortable conclusion, which is probably more important in an often more simplistic stage musical format. Based in Brooklyn, USA, the story follows a young man Tony Manero as he navigates through the aforementioned themes as well as his job in a paint store, relationships with friends and lovers and his escape at the discotheque. Unfortunately this Matt Byrne Media Adelaide premiere production only adds to the shows writing woes. The pace was incredibly slow, sound consistently quiet (or non-existent), set clunky, energy flat and somehow some usually fantastic singers consistently struggled with their harmonies. In the main role of Tony Manero, Sebastian Cooper provides a solid confident performance, dances well and his voice sounds great. Amber Platten dances expertly as Stephanie Mangano and has a commanding speaking voice. Iman Saleh as Bobby C and Matthew Pugsley as Frank Manero Jr. both provided some much needed energy and depth to the performance, which was lacking elsewhere. Jonathan Dragt as Double J, Lauren Noble as Annette, Anthony Butler as Joey and the Manero family (Russell Ford, Niki Martin, Lauren Hubner and Cheryl Ford) will hopefully develop in confidence and characterisation as the season continues. The ensemble looks fabulously authentic in their 1970’s costumes by Sue Winston and does well to showcase Sarah Williams’ compelling choreography, with the dance competition a highlight of the show. The set and design will work better in the Shedley Theatre at Elizabeth where the audience can look down to the dance floor lighting, but at the moment in the Arts Theatre it is simply a trip hazard for the cast and crew. The front of the stage was under-utilised and until the lighting and sound operation is tighter, there are scenes that are hard to focus on the action. Overall, Saturday Night Fever required more rehearsal time and must pick up its pace as it nearly goes for 3 hours, but hopefully the set changes will quicken leaving less long pauses in the dark. I left the theatre questioning how so many elements went wrong for a company usually producing high-quality musical theatre in Adelaide. 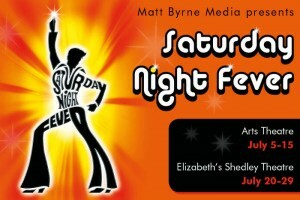 Saturday Night Fever continues at Arts Theatre at various times until Sat 15 Jul and at Elizabeth’s Shedley Theatre at various times from Thu 20 Jul until Sat 29 Jul. Bookings at Matt Byrne Media on 82624906 and mattbyrnemedia.com.au. Click HERE to purchase your tickets. Arts Theatre, Thu 6 Jul. With music and lyrics by The Bee Gees and based on the 1975 article Tribal Rites Of The New Saturday Night and the famous 1977 movie, you would think that the musical version would be a sure hit. The show continues to tour the world, but fails to win awards and is reported to have confused audiences buying tickets hoping to relive some exhilarating 1970’s disco memories. The story actually covers some powerful themes including family violence, Catholicism, suicide, abortion, racism, sexism, alcohol and other drug use, but awkwardly doesn’t bring many of the themes to any comfortable conclusion, which is probably more important in an often more simplistic stage musical format. Based in Brooklyn, USA, the story follows a young man Tony Manero as he navigates through the aforementioned themes as well as his job in a paint store, relationships with friends and lovers and his escape at the discotheque. Unfortunately this Matt Byrne Media Adelaide premiere production only adds to the shows writing woes. The pace was incredibly slow, sound consistently quiet (or non-existent), set clunky, energy flat and somehow some usually fantastic singers consistently struggled with their harmonies. In the main role of Tony Manero, Sebastian Cooper provides a solid confident performance, dances well and his voice sounds great. Amber Platten dances expertly as Stephanie Mangano and has a commanding speaking voice. Iman Saleh as Bobby C and Matthew Pugsley as Frank Manero Jr. both provided some much needed energy and depth to the performance, which was lacking elsewhere. Jonathan Dragt as Double J, Lauren Noble as Annette, Anthony Butler as Joey and the Manero family (Russell Ford, Niki Martin, Lauren Hubner and Cheryl Ford) will hopefully develop in confidence and characterisation as the season continues. 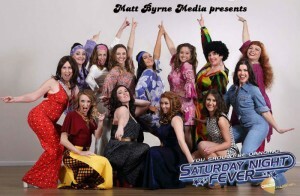 The ensemble looks fabulously authentic in their 1970’s costumes by Sue Winston and does well to showcase Sarah Williams’ compelling choreography, with the dance competition a highlight of the show. The set and design will work better in the Shedley Theatre at Elizabeth where the audience can look down to the dance floor lighting, but at the moment in the Arts Theatre it is simply a trip hazard for the cast and crew. The front of the stage was under-utilised and until the lighting and sound operation is tighter, there are scenes that are hard to focus on the action. Overall, Saturday Night Fever required more rehearsal time and must pick up its pace as it nearly goes for 3 hours, but hopefully the set changes will quicken leaving less long pauses in the dark. I left the theatre questioning how so many elements went wrong for a company usually producing high-quality musical theatre in Adelaide. 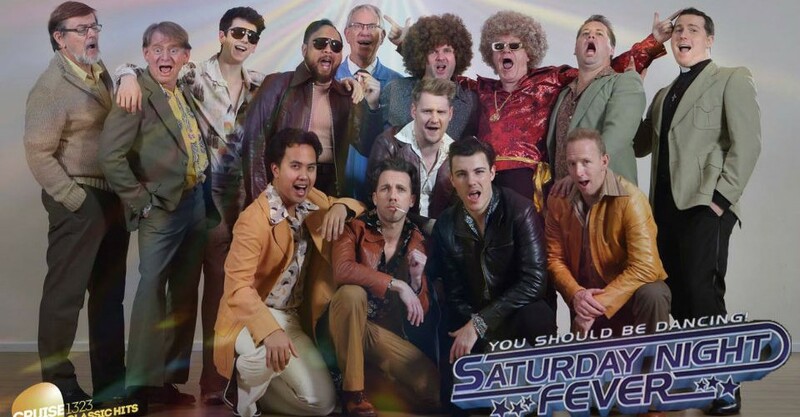 2.5 stars Bobby Goudie Saturday Night Fever continues at Arts Theatre at various times until Sat 15 Jul and at Elizabeth’s Shedley Theatre at various times from Thu 20 Jul until Sat 29 Jul. Bookings at Matt Byrne Media on 82624906 and mattbyrnemedia.com.au. Click HERE to purchase your tickets. Adelaide independent online magazine. Bringing you news, reviews, interviews and competitions from Adelaide's festivals, music, art, theatre and comedy scene... because we know you love the Arts as much as we do!